From comic books, novels, video games, and cartoons, to board games, toys, and even theme park rides, Hollywood seems to have no shame when it comes to pillaging material from other mediums. Sadly, however, this trend often comes at the expense of original stories. After all, why should studios waste money on new, completely unproven properties when everybody already loves 'Iron Man'? 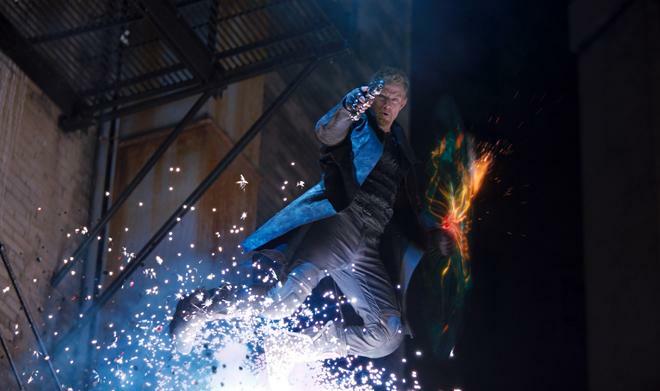 With this rather disheartening trend in mind, the Wachowskis' latest sci-fi action flick, 'Jupiter Ascending,' is actually something of a rarity. As a big budget spectacle that's not based on an already existing franchise, the film offers a cinematic breath of fresh air among a sea of sequels, adaptations, reboots, and remakes. Unfortunately, that once crisp air starts to turn rather stale as the runtime goes on. The story and characters might be original, but that doesn't mean that they're actually interesting. Hmm, maybe they really should have tested this out as a comic book first? Jupiter Jones (Mila Kunis) is an average young woman toiling her life away as an underappreciated cleaning lady. But when a group of aliens become hell-bent on eliminating her, Jones' once mundane existence suddenly becomes a bit more exciting. With the help of a gene-spliced soldier named Caine Wise (Channing Tatum), she is whisked away on a cosmic journey to uncover her secret intergalactic royal heritage. With the very fate of the Earth in her hands, Jupiter will have to "ascend" or risk losing everything she cares about. Using a classic fairy tale premise as its jumping off point, the script offers a sci-fi twist on a traditional rags-to-riches story. Jupiter gradually goes from being a mere servant to becoming true royalty, and while there are no medieval castles or fantasy lands in sight, there are plenty of extravagant spaceships and strange alien worlds. Unfortunately, though the core of this concept has a lot of potential, the Wachowskis fail to develop any truly engaging drama or characters for us to care about. That is, with the exception of Sean Bean's Stinger Apini, who we only pay attention to in order to see if the actor somehow manages to live through a movie for once. Now that would be a twist! As a protagonist, Jupiter never really shows off much personality and Mila Kunis always seems a bit uncomfortable in the role. Her job is to basically look confused and overwhelmed by all of the crazy things happening around her… and that's about it. Sure, she does eventually start to take control of her situation, but the character comes across as disappointingly flat -- both from a writing and performance standpoint. Channing Tatum's utterly clichéd Caine Wise doesn't really fare much better either. He's a standard strong, quiet hero who predictably falls in love with Jupiter (in a romantic subplot that proves to be painfully underwritten and cheesy). Despite the inherent gravitas of their British accents, the villains are also rather one-note, and though he brings a level of convincing menace, Eddie Redmayne's paradoxically deep yet whispery voice makes it sound like he constantly has something stuck in the back of his throat. I often couldn't tell if he was evil or just needed a lozenge. To their credit, the Wachowskis do inject the plot with a lot of ostensibly creative ideas and cool sci-fi concepts -- including gene-splicing, reincarnation, life extension, and some light bureaucratic satire -- but most of these elements are underdeveloped and muddled together. The genetic modification aspect, in particular, never adds up to much and actually comes across as kind of lame. Sure, Tatum's character is technically half dog -- or half wolf, or maybe half wolf-dog (you know, like Balto) -- but outside of his teeth, ears, and a fleeting moment where he uses his enhanced senses, this aspect is never really utilized. Attempts at social commentary about class and privilege also end up falling flat, and even though the story is ultimately simplistic, the first half of the movie is pretty confusing to follow. Thankfully, despite all of the film's narrative flaws, 'Jupiter Ascending' still manages to absolutely wow when it comes to visuals. Costumes, sets, makeup, and CG work are mostly stunning, fully realizing the film's expansive science fiction world. There are a few decidedly less than impressive character designs here and there, but the majority of the runtime is littered with spectacular imagery that features a painstaking level of attention to detail. Action scenes are also especially noteworthy, and each set piece offers a thrilling experience. An early chase scene between swooping alien ships and Caine as he glides through the cityscape of Chicago on his floating gravity boats is a genuine highlight that relishes in a child-like sense of wonder. And the Wachowskis' judicious mixture of practical stunts with key CG embellishments really helps to ground the outrageous action with a comparative sense of visual reality. Later space battles and laser shootouts are all impressive as well, and of course the directors' trademark use of slow motion makes a few notable appearances. Yes, 'Jupiter Ascending' has a thin plot, banal dialogue, and broad characterizations, but there is still a certain level of fun to be had here and the movie's tone (usually) doesn't take itself too seriously. Outside of its storytelling shortcomings, the flick still features some dazzling set pieces and imaginative visuals. Though the Wachowskis continue to have major issues when it comes to scripting, they have at the very least dared to bring something original and ambitious to the screen. Sure, I doubt many kids will be trading in their Optimus Prime Halloween costumes to dress up as Caine Wise anytime soon, but even a mediocre original sci-fi flick is better than a lazy toy cash-in. And who knows, despite being a box office flop, maybe one day Hollywood will be "brave" enough to revisit the movie for a sequel… or a reboot, or a remake, or a sequel that is also somehow a reboot and a remake. And also good. That would be impressive. 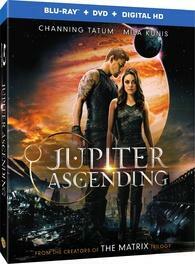 Warner Bros. brings 'Jupiter Ascending' to Blu-ray on a single BD-50 disc that comes housed inside a keepcase with a cardboard slipcover. A separate DVD copy and instructions for a Digital HD UltraViolet copy are included inside. After some skippable trailers, the disc transitions to a traditional menu screen. A Blu-ray 3D release is also available. The movie is provided with a 1080p/AVC MPEG-4 transfer in the 2.40:1 aspect ratio. Filled with dazzling sci-fi imagery, the film comes to Blu-ray with a spectacular video presentation. The digital source is clean and crisp throughout, and with the exception of some light noise during dark scenes and a negligible hint of false contouring, there are no troublesome artifacts to report. Clarity and dimension are very strong, offering a sharp picture that highlights all of the intricate textures in the film's elaborate alien costumes, sets, and CG creations. Sequences that feature large groupings of objects are particularly impressive, including a scene set in a shrine with hundreds of candles, a scene with swarming bees, and a space battle with thousands of flying ships. Each and every tiny object is visible on-screen, offering an impeccable sense of fine detail. Colors are also sumptuous, and the movie provides a rich and varied palette that changes depending upon the location and alien world, transitioning from cool greens and blues to more aggressive oranges and reds. Whites are bright and overall contrast is solid, but black levels are a bit on the grey side, sometimes lacking the inky quality found in other releases. 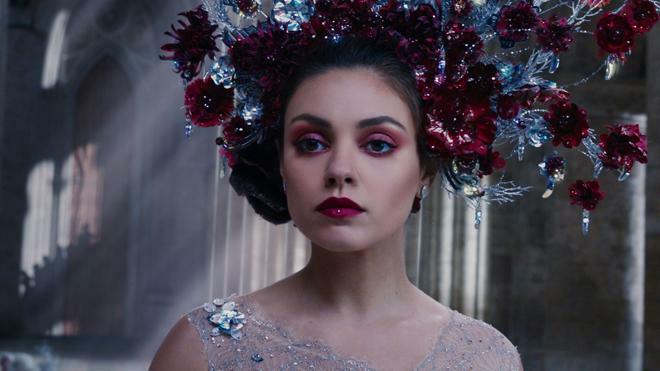 Though the story might disappoint, 'Jupiter Ascending' features some rather striking visuals, and this HD transfer does them all justice. Gorgeous and technically strong, this is an exceptional image. The film is presented with an English Dolby Atmos soundtrack along with English SDH, French, and Spanish subtitles. Though I do not currently have an Atmos setup of my own, Dolby was nice enough to let me screen the Atmos audio track in their New York demo room. I also watched the film first through my current home theater setup with the Dolby TrueHD 7.1 track. Below are my overall impressions of the TrueHD audio, followed by specifics about the Atmos experience. Dolby TrueHD 7.1 - Immersive and absolutely assaultive when its needs to be, this is a spectacular audio mix that fully envelopes the audience within the Wachowskis' lively sci-fi world. Dialogue is clear and well prioritized (ignoring Eddie Redmayne's gasping delivery, of course). The soundstage is layered and textured throughout, giving each location an appropriate sense of atmosphere. Comparatively low key settings like the streets of Chicago or a country home offer general ambiance (traffic, pedestrians, birds, etc. ), but the movie really comes alive during its numerous set pieces. These action scenes are absolutely fantastic, circling the room with aggressive, deliberate and nuanced effects work. Laser blasts, roaring engines, gliding hover boots, and explosions seamlessly transition from speaker to speaker with smooth directionality and engaging surround use. Bass activity is also powerful and room-shaking without becoming too overwhelming, and there a few key low frequency cues that prove to be very effective and subtle. Likewise, quieter moments offer noteworthy design work and immersion too, including a scene where bees swarm around Jupiter and the listener. Michael Giacchino's stirring score is beautifully realized as well with great dynamic range and separation. Spacious and detailed, the audio track never fails to impress, offering a genuine demo worthy presentation even without the benefit of Atmos. Dolby Atmos - To review the Dolby Atmos track, I screened the film at Dolby's demo room in their New York office. The setup uses a 7.1.4 configuration with four in-ceiling Triad speakers and an Onkyo TX-NR3030 A/V receiver. Simply put, this is an exceptional mix that does a great job of spotlighting the benefits of the addition of overhead audio. The four ceiling speakers feature lively activity, enhancing ambiance and action sequences through key effects, allowing the sound to truly engulf the room from all directions. The gravity boots chase scene is a real highlight, as we can hear the flying ships transition from the front, back, and heights as they swoop around the environment. Explosions and falling debris also make great use of the overhead placement, allowing the sound to start from above and then transition down. A creaking ship, buzzing bees, and a computer voice provide more subtle use of the ceiling speakers too, and the sequence where Titus Abrasax floats around with his women spreads the group's giggling and moaning to the overheads as well. One scene even features a character being held prisoner in a cell beneath the floor, and as his captor approaches from above, the sound of their footsteps is appropriately placed up in the soundstage. Delicate and aggressive design choices like this littler the track, making full use of the expanded speaker placement. Of course, the numerous action scenes are absolutely buzzing with activity from all directions, and though it can be admittedly hard to pinpoint exactly where all the sounds are coming from during the film's more chaotic moments, I would periodically stand directly under the height speakers to see just how active they were. From flapping wings and laser blasts, to exploding thunder and warp drive engines, the overheard presence remains frequent and deliberate. Likewise, Michael Giacchino's rousing music benefits greatly from the added height speakers, allowing his score to boom from above with epic bravado. As impressive as the traditional TrueHD presentation is, the Atmos track really does create an even more immersive experience. Though some of the movie's livelier sequences can lose a bit of nuance during all the action, the implementation of overhead audio comes across as natural and beneficial. Along with 'Gravity,' 'Jupiter Ascending' is now definitely one of the best showcases for Dolby Atmos in the home theater. Warner Bros. has included a mostly worthwhile series of behind-the-scenes featurettes with on-set footage and cast & crew interviews. All of the supplements are presented in 1080p with Dolby Digital 2.0 audio. Jupiter Jones: Destiny is Within us (HD, 7 min) – The first featurette focuses on Jupiter's story arc. Unfortunately, the comments here can be a tad fluffy. Caine Wise: Interplanetary Warrior (HD, 5 min) – In this featurette, the focus shifts to Channing Tatum's character. This material is a bit more substantive, offering some insights into designing the character's look, stunts, and gravity boots. The Wachowskis: Minds Over Matter (HD, 7 min) – The directors get the spotlight here with participants discussing their style, approach to filmmaking, and enthusiasm for original material. The complimenting can get rather hyperbolic (especially after seeing the movie), but it's worth a look. Worlds Within Worlds Within Worlds (HD, 10 min) – This featurette discusses creating the world of the film with details on costumes and sets, offering a cool look at the production designs. Jupiter Ascending: Genetically Spliced (HD, 10 min) – Here, the focus is on designing the gene-spliced characters and CG creatures. Bullet Time Evolved (HD, 10 min) – This supplements tackles the film's action scenes, revealing how practical stunts, green screen work, wire rigs, and CG were used to realize the impressive set pieces. From Earth to Jupiter (And Everything in Between) (HD, 10 min) – This last featurette is a bit redundant, and once again addresses creating the world, characters, story, and themes. 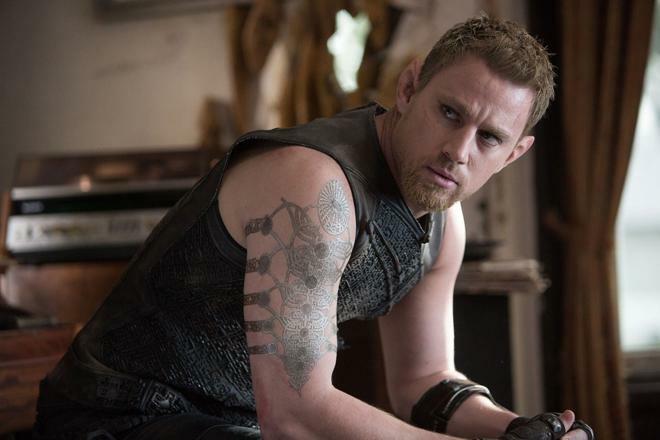 The Wachowskis' 'Jupiter Ascending' is an original yet sadly mediocre sci-fi spectacle. The action and visuals are stunning, but the story and characters leave a lot to be desired. Thankfully, this disc features spectacular video and audio, fully immersing the audience within the movie's space opera action. Though not loaded with supplements, the included featurettes offer a few worthwhile behind-the-scenes insights. The movie itself has a lot of problems, but the production is very ambitious and there is still some decent entertainment value here. Likewise, the Blu-ray's technical presentation is top-notch, making it perfect demo material -- especially for customers who own Dolby Atmos setups. Worth a look.